We want our clients to succeed, and we consider it a privilege to be a part of a team working toward a common goal. Whether your company is looking for new custom POP displays that are easily shipped, or a warehousing service that can meet your storage needs, we see ourselves as your partners. We want to work closely together to put your best foot forward. The bottom line is we want you to achieve tangible, measurable results. The Naked Bee provides high-quality, all natural products including lotion, lip balm, shampoo and soap. The company is also an advocate for raising awareness of the importance of honeybees to the natural ecosystem. Officials at The Naked Bee approached McIntyre Manufacturing Group to upgrade and modernize the current version of their wood displays to highlight their brand and products. It was very important to the client that this new display was easy to assemble and to expand, addressing the concerns they had with their previous wooden displays. Our creative process started with our experienced retail design team, who created an extensive variety of sketches and renderings of different sized displays that accommodated products in various dimensions and product capacities. The key was to provide a clean and attractive aesthetic across the board. This resulted in modular, in-store retail display units made out of metal that effectively highlighted both the Naked Bee brand and their products. After company representatives from The Naked Bee chose a design they liked, we forged ahead with our engineering expertise. We created a final product using only two types of material: one-inch tubing and sheet metal. By limiting the number of materials, we were able to keep the project cost under the clients’ budget. We were also aware that the company emphasizes the importance of environmental responsibility, and we wanted to do everything in our power to honor that philosophy. Therefore, we carefully designed each part of the three-piece modular display to make the smallest footprint possible. This not only appealed to their audience, but it also reinforced their brand story while enabling the POP display to stay under the size requirements to ship via UPS or FedEx ground — saving our client money almost immediately! The overall result was higher sales and satisfied customers. In fact, The Naked Bee doubled their display orders from the previous year because of their customer’s positive response and anticipated increase in product sales. Needless to say, The Naked Bee was pleased with the outcome of their new retail display units. 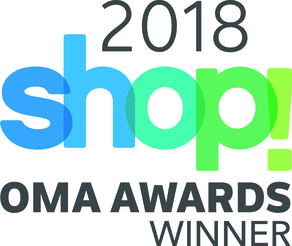 In addition, our display units won an award at the 2018 Shop OMA Awards. These awards honor excellence in design as well as successful results in increased sales and customer satisfaction. Do you have a vision of where you’d like for your business to be in five years? Ten years? Are you sure you have all the tools you need to make that possible? Don’t overlook the importance of a solid, beautifully designed POP display; it is a perfect complement to your product and overall branding strategy. Contact us for more information. We’d love to help you achieve your vision.